Overnight Wednesday Israeli aggression on multiples Syrian sites wasn’t the end of it, much more sure to come – partnered with Washington in waging undeclared war on Syria and Iran. It’s been ongoing for decades. Trump’s JCPOA pullout, along with US/Israeli rage for regime change and Russia’s failure to challenge their regional aggression, suggests much greater trouble to come – the ominous threat of full-scale war on Syria and Iran, a nightmarish scenario. The only Middle East “murderous regime(s)” are US-supported despotic ones, Israel, and America’s regional presence, not Iran, the region’s leading peace and stability advocate, not Syria, a nation struggling valiantly against US-led aggression. Trump falsely accused Iran of links to al-Qaeda and other terrorist groups. Just the opposite is true, the Islamic Republic combating this US-supported scourge. Following Israel’s latest aggression in Syria, its security cabinet met Thursday night plotting its next moves, further military action sure to come. Israeli ministers saying they have no intention of escalating conflict was a bald-faced lie. 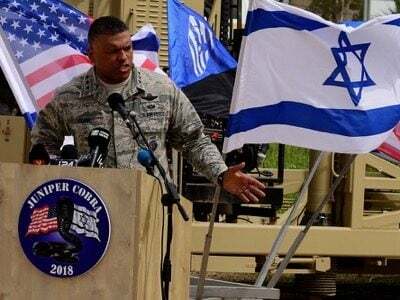 The IDF continues provoking Syria and Iran to retaliate against its aggression, wanting a pretext great enough for potential full-scale war on both countries. The threat of it erupting is real, things heading ominously in this direction – one hostile action against Syria and Iran at a time. Major conflicts begin incrementally. The Middle East is the world’s leading hotspot. Netanyahu lied claiming “Iran crossed a red line,” falsely accusing its military of firing rockets on occupied Israeli Golan targets. “We are in a protracted campaign, and our policy is clear. Iran cannot be allowed to entrench itself militarily in Syria” he added. Ghasemi criticized the international community’s failure to condemn Israeli aggression, assuring more of it to come, partnered with Washington. The statement condemned numerous JCPOA breaches, stressed Iran’s full compliance with its principles, noted that it’s an international accord adopted unanimously by the Security Council, requiring all nations to observe it. America and Israel are serial lawbreakers, both countries threatening regional and world peace. They’re in no position to criticize Iran or any other countries. The Islamic Republic’s foreign minister is tasked with enlisting support from other JCPOA signatories, Iran’s economic partners, and the international community to guarantee Tehran’s rights under the nuclear deal. The Atomic Energy Organization of Iran head is charged with pursuing all necessary steps required to pursue unrestricted pre-JCPOA nuclear activities if diplomatic efforts fail. Trump illegally reimposed nuclear-related sanctions on Iran. The US Treasury sanctioned six Islamic Revolutionary Guard Corps (IRGC) officials and three Iranian enterprises, more of the same to come – flagrantly breaching unanimously adopted Security Council Res. 2231 (July 2015) affirming the JCPOA, making it binding international law, prohibiting any nation from unilaterally abrogating it. America is an international outlaw, breaching the JCPOA one of numerous examples along with its endless wars of aggression. Will nuclear deal signatories Britain, France and Germany reject US reimposed nuclear-related sanctions or bow to Washington’s will on this vital issue? In 1996, the EU adopted a Blocking Regulation, largely aimed at countering US sanctions on Cuba and Iran. If invoked to challenge US reimposed nuclear and related sanctions on Iran, EU companies could engage in unrestricted trade with the Islamic Republic – risking loss or restricted access to the US market. It’s clear which choice they’ll make unless the EU vowed to sanction US businesses in retaliation, a most unlikely prospect. Brussels wants good economic relations maintained with Washington, likely to sacrifice trade with Iran to assure it, going along with Trump’s action despite publicly sticking with the JCPOA. Prospects for saving it as slim. The deal’s demise virtually assures Iranian resumption of pre-JCPOA nuclear activities. Trump vowed severe consequence if events unfold this way. Clearly tougher US sanctions will be imposed, aiming for isolating Iran economically and politically. Will US/Israeli war on the Islamic Republic follow? Will Russia intervene as it did in Syria? Is East/West confrontation inevitable?